Innovative 360 solutions to move your business forward. FeedbackOnline™ is a 360 degree (multi-rator) tool, designed to be used as a process companion to serious performance management initiatives, addressing the effectiveness of individuals, teams and organizations. FeedbackOnline™ works best when it is used for a clear business purpose, providing employees with insight into the skills they must develop to help the organization meet its goals. FeedbackOnline™ provides a user friendly web-based solution, no software or prior technical expertise is required. It can be used for large organizations right down to single users. FeedbackOnline™ not only provides a cost effective solution for both individuals and organisations, it can also engage participants in a revealing and dynamic feedback process that is excellent for self-development and career planning. FeedbackOnline™ provides a user friendly web-based solution, no software installation or technical expertise is required. Our responsive 360 degree software easily adapts for use on smartphones, tablets, laptops or desktop computers. No Consultants needed - Simple administration screens provide clear and easy navigation and leave many opportunities for customization, printing reports and setting up surveys without the support from external consultants. 360 degree questionnaires collect sensitive information – we take the security of that data seriously. FeedbackOnline™ uses 128-bit encryption; all survey data are encrypted and stored safely on our secure server. FeedbackOnline™ is available to users in various languages and can be customised easily for other languages as and when required. Languages supported: Danish, Dutch, Chinese, English, Finnish, French, German, Italian, Norwegian, Russian, Spanish, and Swedish. Participating managers will find FeedbackOnline™ a quick, down-to-earth and hassle-free tool that works well with the most common web browsers on the market. Everybody should have the possibility to reach their full potential. 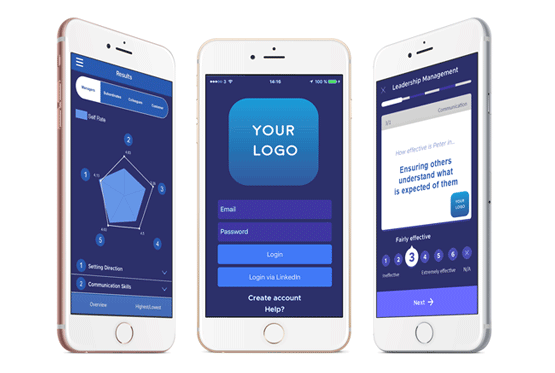 Our mission is simple: Insights For You has developed a mobile application to help users take charge of their own professional development with the help of self-assessment and feedback from people in their network. "Make feedback normal. Not a performance review." Our goal is to make feedback a normality at the workplace. With our new Corporate App Solution you can get a completely branded app based on your company's brand available in the Apple and Google stores, with customized surveys and features to match your company’s developement needs. Economic depression cannot be cured by legislative action or executive pronouncement. Economic wounds must be healed by the action of the cells of the economic body. Business is all about the customer: what the customer wants and what they get. Generally, every customer wants a product or service that solves their problem.